This paper provides new insights into the food security performance of long and short food chains, through an analysis of the resilience of such chains during the severe weather events that occurred in the Australian State of Queensland in early 2011. Widespread flooding cut roads and highways, isolated towns, and resulted in the deaths of people and animals. Farmlands were inundated and there were food shortages in many towns. We found clear evidence that the supermarket-based (long) food chain delivery system experienced significant difficulties in supplying food to flood-affected towns. 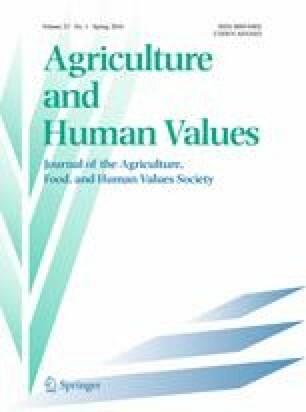 In contrast, more localized (short) food supply chains—which relied upon supply from growers in peri-urban areas and community-based food initiatives—remained largely intact, and provided food at a time when the supermarkets were limited in their ability to respond to consumer demand. However, on closer examination of food distribution during flooding in the regional city of Rockhampton and in the State capital, Brisbane, the demarcation of success between “long” and “short” food chains became blurred. Both types of food supply chains shared some key resilience characteristics in responding to crisis but diverged in other important ways. We argue that conceptualizing food chains in terms of key elements of resilience—scale, diversity, flexibility and cohesion—may be more fruitful than the short-long dichotomy alone. This approach is particularly useful when prioritizing food security as the basis for evaluating food system sustainability in a context of predicted increases in extreme weather events and future climate change. This study was funded by the Australian Research Council (Discovery Project DP120101949)—Governing Food Security in Australia in an Era of Climate Change: A Sociological Analysis. Professor Lawrence was also part-funded by the National Research Foundation of Korea (NRF-2010-330-00159) and the Norwegian Research Council (FORFOOD No. 220691). Anderies, J.M., C. Folke, B. Walker, and E. Ostrom. 2013. Aligning key concepts for global change policy: Robustness, resilience, and sustainability. Ecology and Society 18 (2): 8. doi: 10.5751/ES-05178-180208. Accessed 5 Mar 2015. Australian Government. 2013. Tropical cyclones in Queensland. http://www.bom.gov.au/cyclone/about/eastern.shtml. Accessed 15 Aug 2013. Certified Farmers Markets. 2002. Certification. http://www.farmersmarkets.org.uk/certification2.htm. Accessed 14 Jan 2014. Climate Commission. 2013. Droughts, floods and climate change. http://climatecommission.gov.au/effects/droughts-rainfall-effects/droughts-floods-and-climate-change/. Accessed 9 Sep 2013. Coles. 2013. Helping Australia grow. http://www.coles.com.au/helping-australia-grow. Accessed 20 Jan 2014. CSIRO. 2011. Frequently asked questions about the impact of floods on agriculture and food. http://www.csiro.au/Outcomes/Environment/Australian-Landscapes/Flood-Impact-on-Agriculture.aspx. Accessed 3 Dec 2011. CSIRO and Bureau of Meteorology. 2012. State of the climate 2012. http://www.csiro.au/Outcomes/Climate/Understanding/State-of-the-Climate-2012.aspx. Accessed 10 May 2013. Folke, C., S. Carpenter, B. Walker, M. Scheffer, T. Chapin and J. Rockstrom. 2010. Resilience thinking: Integrating resilience, adaptability and transformability. Ecology and Society 15(4): 20. http://www.ecologyandsociety.org/vol15/iss4/art20/. Accessed 5 Mar 2015. Queensland Floods Commission of Enquiry. (QFCE). 2012. Final report. Brisbane: Queensland state government. http://www.floodcommission.qld.gov.au/__data/assets/pdf_file/0007/11698/QFCI-Final-Report-March-2012.pdf. Accessed 12 Dec 2013. Sydney Morning Herald. 2011a. Groceries going via NT and sea barges. 13 January. http://www.smh.com.au/environment/weather/groceries-going-via-nt-and-sea-barges-20110112-19oaz.html. Accessed 15 Nov 2012. Sydney Morning Herald. 2011b. Floods empty the food bowl. 24 January. http://www.smh.com.au/environment/weather/floods-empty-the-food-bowl-20110123-1a18b.html#ixzz2EcFxnSLt. Accessed 15 Nov 2012. Sydney Morning Herald. 2011c. Major supermarkets close as shelves empty. 12 January. http://www.smh.com.au/environment/weather/major-supermarkets-shut-down-as-shelves-empty-20110112-19nrh.html. Accessed 19 Nov 2012.